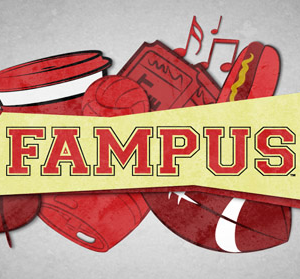 Fampus is an events website exclusively for college students which launched in September 2011. The site aims to keep students in the loop regarding just about every imaginable college event, and currently has seven colleges on board. Fampus was founded by 22 year old Brittany Brody, and today we are lucky enough to have Brittany on the Startup Project. Firstly, where did the idea behind Fampus come from? How did you design and develop the final product? When I was a freshman at The University of Wisconsin-Madison, I found campus life to be extremely overwhelming. There was so much to do and learn, so many people to meet, and I didn’t even know where to begin. I was extremely involved in high school and wanted to replicate that experience in my college life, so I began looking and asking around for a central location to find everything happening on and around campus. Much to my surprise, there wasn’t one. After several frustrating experiences and missed opportunities, I decided I’d had enough. I reached out to my dad, an entrepreneur, and said that I had an idea for a website that would bring everything happening on and around campus to one location, and would be able to recommend things I might be interested in based on how I used it. We asked a lot of questions and reached out to others who had experiences in the technology field, and it evolved over the next three years into the www.fampus.com we have recently launched at seven campuses. Now, however, there are several additional components supplementing the original concept and students can also share their experiences at events through photos, comments, check-in, etc. Fampus has launched into an exceptionally crowded market – competing with big players like Facebook in the event space – how does Fampus differentiate itself? What advice can you offer to fellow entrepreneurs in this regard? There are several ways that we feel Fampus differentiates itself among other sites that may deal wholly or partially in the event space. First of all, we are in no way trying to be Facebook – we all love Facebook and think what they are doing is great! That being said, Fampus allows users to search out events and receive recommendations for events in a way that Facebook doesn’t allow. We feel that Fampus supplements Facebook – Fampus is a platform for organized events that are open to the entire campus, regardless of whether you know them or not. It is the most comprehensive database of events found anywhere and the information on our events is accurate. Members of our team dedicate their day to making sure that if the price says $20.00, you can come with a twenty-dollar bill in your hand and know that you will get in. Additionally, photos on Fampus are organized by event, rather than person. If a concert comes to town and you want to see everyone’s photos from one event in one place, Fampus makes that possible for you as a user. Also, if you are unable to attend an event you are able to see events unfolding live through a feature we call the MainStream. How are you monetizing the service? What approaches did you consider? We are monetizing the site through advertisement-based revenue. We did a lot of research regarding ads, because everyone seems to operate under the assumption that “everyone hates ads”. Our research showed us, however, that as long as the advertisements are not intrusive, and they are local or relevant, college students don’t actually mind minimal ads. Fampus.com has always been and continues to be a free service – this is also true of our mobile application. The web design of Fampus is fantastic – can you share some detail on the design process? In your opinion – how critical is web design to the success of any startup? Well thank you! The team of developers that helped build and design the site has been outstanding. We have implemented cutting edge technology and a sleek/clean interface that we feel resonates well with the college demographic. The design process has been as we tried to get the right look and feel, and we are all very pleased with this final result. That being said, Fampus is continually evolving and we take into consideration all of the feedback we receive to determine what the next direction or development in design and technology will be! I personally feel that web design is extremely critical to a start-up. I have always been taught that you only get one chance to make a first impression, and for a website, that is in the design. There is a sense of legitimacy found in certain websites upon first glance, and that was definitely something we were looking to achieve with the design of Fampus.com. What plans for the future growth of Fampus do you have? The site is currently only for college students – do you have any plans for expansion into other markets? Right now we have launched at seven schools in the Midwest, but absolutely plan to expand. The goal is to be the go-to place for students to find everything on campus and we often say we would like to expand to around 300 schools. As of right now, we are laser-focused on colleges, and we know this is a service that will benefit them greatly and allow them to gain the most from their college experience. Finally, what advice can you offer to aspiring entrepreneurs looking to take the leap into entrepreneurship? My advice to aspiring entrepreneurs is definitely to take the leap, dive into your project, and learn as much as you possibly can along the way. I don’t believe that a failed venture is ever a true failure, because the people you meet and the lessons you learn throughout the process are invaluable.